Mahmoud Ahmadinejad (Persian: محمود احمدی نژاد, Mahmūd Ahmadinezhād Mahmoud Ahmadinejad Clean.ogg mæhmuːd-e æhmædiː-neʒɒːd (help·info); born 28 October 1956) is the sixth and current President of the Islamic Republic of Iran. He became president after winning the 2005 presidential election and was elected to a second term in 2009 after a disputed election. Many Iranians are involved in ongoing mass protests claiming election fraud and other abuses. Despite his title, he does not hold the highest constitutional office in Iran, which belongs to the Supreme Leader of Iran (Ali Khamenei), who is also the commander-in-chief of the armed forces of Iran, according to Article 113 of the Constitution of Iran. 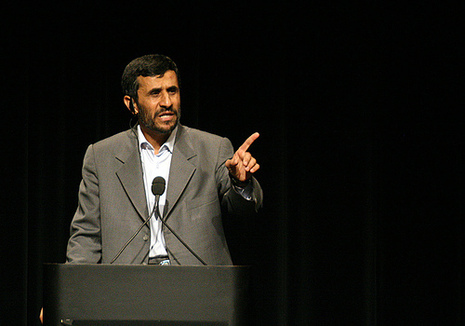 Prior to becoming president, Ahmadinejad was mayor of Tehran and governor general of Iran's Ardabil Province. TEHRAN: Moderate ex-premier Mir Hossein Mousavi claimed victory in a hotly contested presidential vote in Iran on Friday while state news agency said hardline incumbent Mahmoud Ahmadinejad had won. The conflicting claims came even as crowds of voters were still queuing to cast their ballots long after balloting was officially over at 10:00 pm (1730 GMT). According to the interior ministry, all those in line at that time would be allowed to cast their ballots in the most hotly contested election since the Islamic revolution 30 years ago.